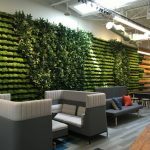 We recently had the opportunity to tour the new corporate HQ for 2U, Inc., an online digital education company, followed by a chat with Christopher “Chip” Paucek, CEO & Co-Founder of 2U, Inc. The move to the new facility, after nine years in their original location, not only celebrates the continuing success of the business but exemplifies the culture that contained therein. 2U CEO and Co-Founder Christopher “Chip” Paucek in front of the front stairwell. Image courtesy of 2U, Inc.
Bob Fox: It was great to be able to have a tour of the building. The space is incredible! Can you tell us a bit about what 2U is all about? Chip Paucek: We partner with top universities to provide the world’s best digital education through master’s level graduate programs and short courses. Our platform provides a comprehensive fusion of technology, services, and data architecture to transform our clients, historically campus-based universities of the highest quality and rigor, into digital versions of themselves. Why should students need to pick up their lives, quit their jobs and move to attend a renowned university? With 2U’s solutions, they do not have to anymore. These types of educational solutions were not available ten years ago when we started our business. Our journey over the past ten years has taken us from our first startup location (where we remained until February of last year) to this building which we have leased in its entirety. For a startup to stay in one space as the business grows is unusual. Even as we added more square footage and people, we did not significantly improve our workspace. Now, the new facility we have built matches the business we have built! One of the most exciting parts about getting our own building is that we got naming rights to the space. That was cool. I never got hung up on it in the past. Being so busy getting to the next step, I don’t often stop to look back. But the first time I saw our logo on our building, I was overwhelmed. There’s something so special about seeing your company’s name up in lights for everyone to see. How about the 2U culture? The vibe in the space is compelling but how would you describe it? We see ourselves as the brand stewards for our university partners. We build and service the operational platforms to run their online programs. Think about the longevity of our partners, the oldest of which, Georgetown University, was founded in 1789. We appreciate the age and the history of those organizations and work to manage those brands with care. Our culture is built on that caring concept. People form permanent relationships with their universities. The bonds between a school and their community are huge. How does that relate to our culture? We market, produce and support those schools and communities on a worldwide basis. Our guiding principles are printed on the back of our security badges because we try and live those principles daily. An example of one of 2U’s eight Guiding Principles on a workspace floor. Image courtesy of 2U, Inc.
Our people live our culture and are reminded of those principles as they move through our space. Our culture matters because that is what drives our business and why 2U occupies a significant place in the ed tech marketplace. We are hard-charging and driven to succeed in supporting our university partners. The decision to go public was supported by our clients, but as a public company, it was essential for us to keep our independence and our culture intact. As the brand steward of some of the best schools in the world, we did not want to make changes to that culture as we moved forward. Great culture, is like the bumpers in the bowling alley – you will not get strikes all the time, but they prevent you from getting gutter balls. How do you connect the culture with the physical design of the space? Our space is like our culture, an atmosphere of openness and transparency. The design follows our principles, be honest, be open, be direct with each other, life is too short, do it as well as you can with no ulterior motives. Near the elevator on each floor, we have installed one of our principles, so everyone is always reminded of how we choose to do business. You have elected to sit in an open office – what is the story behind that? We just had our annual 2U ‘Bring in Your Parents Day’, and that was the most asked question. Most of the parents were surprised by that choice. For us, I think an open environment works better. As we designed the building, we made sure we had enough space for places where private conversations can take place. I do not need to be in a closed office with walls and a door to do most of my work. We have proven that this concept works, provided you have alternative spaces for confidential discussions, as needed. I like it when people are touring the space, and someone says, “Oh, there’s Chip.” That gives me an opportunity to speak hello to potential employees, new hires, and other visitors. I enjoy that. The 2U bookcase on the 12th floor by Chip’s open office. Image courtesy of 2U, Inc. Most of the CEO’s we have talked with say they do need a private office. I don’t buy it! When I need to have a confidential discussion, I can find a place to do so. The reality for me is that most conversations do not require that level of privacy. I purposely chose not to have the boardroom connected to my work area. I see that as shared, 2U space. Other than the boardroom, this floor is identical to all the different workspace floors in the building. One additional note, all the meeting spaces do have blinds installed for when privacy is needed. However, I do not encourage using them. Obviously, there are times when that is necessary, but I wanted to ensure that even though we are a public company, we did not lose the transparency we had before going public. Your leadership style is reflected in the way the space is put together. I don’t think a lot of CEO’s recognize the power of that. How do you view the correlation between leadership and workspace design? Do you think that you have used your office space as a tool to support the business? We’re finding that it’s an evolving concept, but many people don’t understand it. As previously stated, we are a highly focused company and wanted our space to represent that culture. Yes, we are driven to succeed, but we work hard and need our space to support that work. Our headquarters building is open, inviting and accessible but also must be highly productive. Is the space part of your recruit and retain objectives? As an ed tech company, we have a huge runway. We have well over 100 open positions. We must work hard to attract people and it is not just about our location and space; our culture is a huge contributor. We wanted to create an exciting environment with amenities that made coming to work attractive. It was crucial to have an excellent gym and options to provide healthy food. We noticed that some high-tech companies have gone to silly extremes in their design solutions, we wanted our space to be appropriately nice, but we also wanted to be comfortable showing the space to our partners and investors. I think we have managed to execute the design in a way that showcases who we are and how we work. Stairwell connecting the first and second floor on the ground level right after you enter the front door. Image courtesy of 2U, Inc.
Would you say that was the over-arching goal for space? The transition from our former space to the new building was vital. After the move, people were stunned by the change in our environment. Moving from our original startup location was complicated, but we took the time to do things right. We had additional objectives to make sure we had enough space to do things that were not possible before. We are now able to host major events in-house. We were able to accommodate over 70 participants at our investor day – a great turn out. We can also host leadership teams from our partner universities. An internal happy hour, our annual Halloween extravaganza, ‘Bring in Your Parents Day’ – these are all part of our culture and hosting them in our space is an important goal we have met with our new building. Our special events drive our business and offer new ways to attract talent. What about your technology, how do you use that to further the business and promote innovation? We are a cloud-based business, and this has made innovation substantially more cost-effective. We can access all our technology in the cloud. Our technology infrastructure allows us to drive the connection between people and teams, and we have the spaces to support those meetings as we need to bring people together – who may not be in the same physical location. We use Google Hangouts, which is also available in all our meeting rooms, as one way we keep people connected. We are looking at making some changes to the front of the building, providing a way to use more of our outside space. 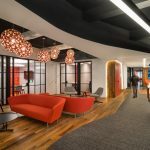 Having that area more “connected” will give our employees more options for work and furthers the evolution of our workspace. Technology has allowed us to grow our business in other locations. Our Denver office now has over 350 people, and we just relocated our New York offices in December to one beautiful, centric space in the DUMBO area of Brooklyn. We have maintained consistency in our approach to the design of each of our locations, but make sure to integrate items that are locale centric. Queen’s “Bohemian Rhapsody” lyrics snake their way up one of 2U’s internal stairwells. Image courtesy of 2U, Inc. The communication of people and space seems to be essential, can you speak to that? This is my third startup, this one worked. I failed in my first two business efforts, so there were lessons learned in how to communicate better, how the business can relate to the workspace and how to express your spirit as a company. I learned a long time ago it is not about me. We are a company filled with people that brighten the room. They are spirited, fun, aggressive, out to win it. I now know it’s just as important to lean on the talented people helping you to build your business from the ground up as it is to lead them, and with that, communication is essential. Where do you find the most significant value of the new workspace? The collaborative space would be the canned answer, but my observation and feedback from the team are that the collaborative space has made a considerable difference in the way we work together. Our open workspace has made it easier to communicate and share ideas, have conversations on the go. The result is more innovation and idea sharing. People are not isolated behind their desks. The access to natural light makes me feel better, and assume others feel the same. We managed to design the open space, being mindful of acoustical issues. We have some areas where there is a considerable amount of phone use. Those acoustical elements have helped keep the noise factor under control. We combined modern technology without making the space feel cold. Our use of natural material and the open ceiling has given us a bright, warm space. We are a friendly group of people and wanted our facility to be the same. Open, collaborative workspace. Image courtesy of 2U, Inc.
How do you measure the performance of the space? Over time, I think we will be able to collect more data-driven metrics. Right now, we are trying to keep pace with our headcount growth and making sure we have the space to accommodate everyone. We average 20 new people a week! Where are you willing to spend the most money? No vanity projects for us! We were focused on getting the most value for the primary architectural design elements. Our stairway connecting the first and second floors was probably our most expensive decision. Our 2U bookcase was a cost-effective branding element. We put money into the lighting and other material choices as well. Then there was the gym, which we wanted to be big enough to accommodate future growth. That amenity has given people pause, and think, “I can quit my gym membership.” We have many workout classes that fill up quickly. There’s also our café and coffee bar that not only provide healthy food options but are a place to gather, regroup and relax. Another picture of the stairwell connecting the first and second floor on the ground level right after you enter the front door. Image courtesy of 2U, Inc.
What is the story other people see when they come into the 2U HQ? The space is a celebration of where we are. Our work is a journey for everyone that occupies our building, and we still have a long way to go. I would hope that they see the energy and dedication of our employees. I am glad we took the whole building, and we are growing into it. What about the spontaneous dance parties we’ve heard about? That is one of the more creative parts of our culture. It is a scene! Our dance parties capture the energy of 2U. They are all about building the cohesiveness of the team – even if you are not one of the dancers, you can appreciate the vibe. When people experience them, they smile. Again, our people brighten the room. 2U and our space are about making people comfortable where they are. Being inclusive is better for the world and better for business. Another picture of the 2U bookcase on the 12th floor by Chip’s open office. Image courtesy of 2U, Inc.